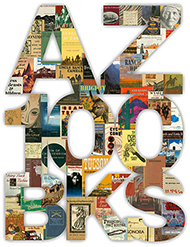 Hinton, Richard J , “The Hand-Book to Arizona: Its Resources, History, Towns, Mines, Ruins and Scenery ,” Arizona 100: Essential Books for the Centennial, accessed April 21, 2019, http://speccoll.library.arizona.edu/online-exhibits-dynamic/az100/items/show/231. 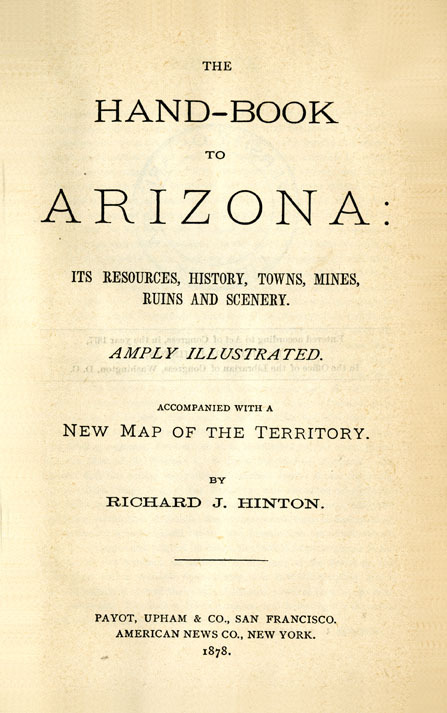 This early, comprehensive, and readable handbook was the result of an extensive tour he made of Arizona in 1877. 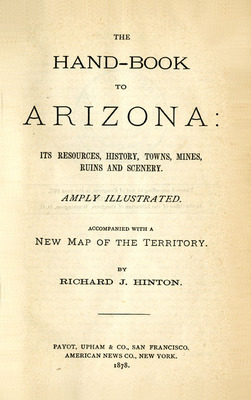 In nineteen topical chapters, he discusses routes from California and Missouri to Arizona; the history of the territory; physical and geological features; mines, towns, and businesses; agriculture, military posts, flora and fauna; Indians; transportation; Spanish explorers; and ancient peoples and their ruins. The Hand-Book appeared at a propitious time, filling an immediate need from prospectors drawn to the territory by the discovery of silver in Tombstone in 1878. San Francisco : Payout, Upham and Company, 1878. 431, ci, 43 p. illus., maps (3 fold. in pocket), port. 29 cm.